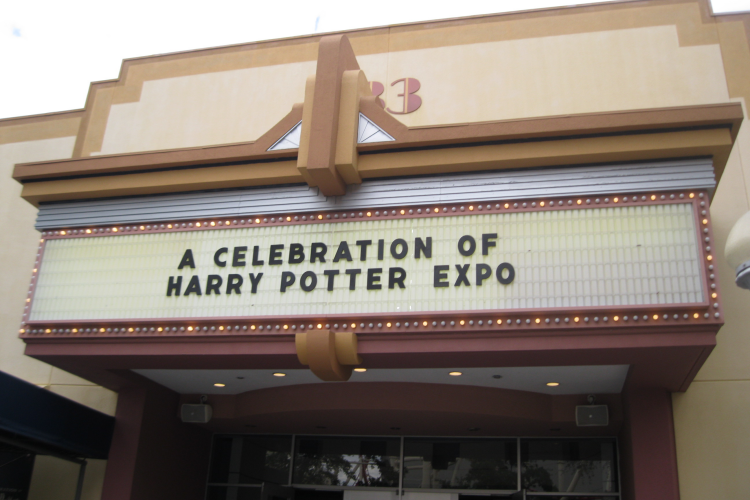 For the past few years, Universal Studios has held A Celebration of Harry Potter event at their theme parks in Florida. For an entire weekend, wizards and witches celebrate the Harry Potter books and movies at Universal Orlando and Islands of Adventure through demonstrations, Q&A’s and exhibits. I’ve been very lucky over the past few years to attend, and this year was no exception. Though I was only able to attend one day and aimed to pack in as much as possible, the event is held over three days. 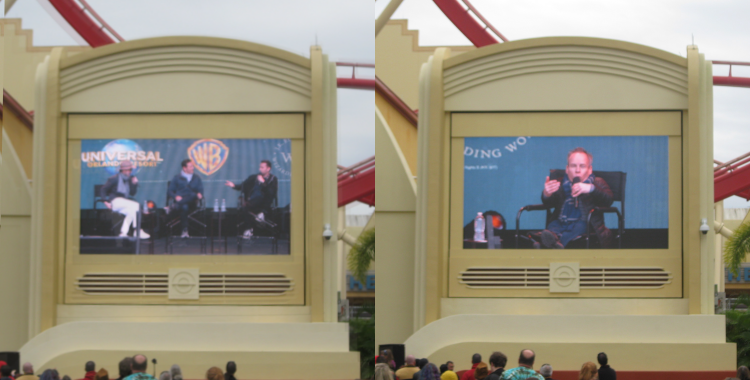 If I could’ve apparated to both parks I would’ve, but chose to stay at Universal Orlando to visit two of their expos and a cast Q&A. The day started off early with getting line for the first expo. 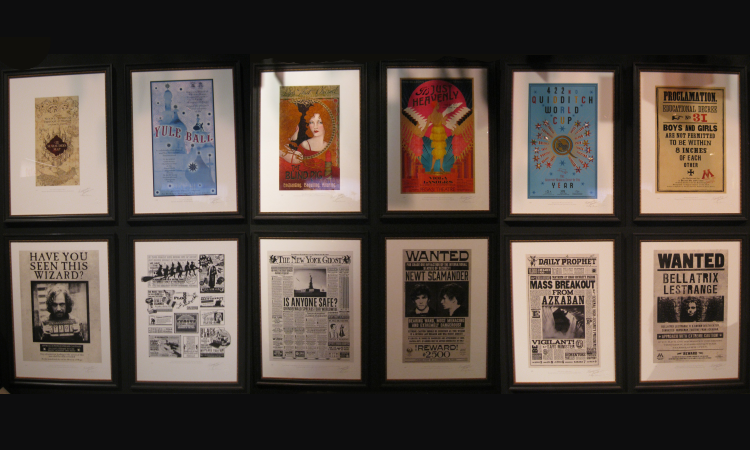 Inside, Scholastic, Warner Bros Studio Tour, the Harry Potter Exhibition, and MinaLima had individual exhibits. 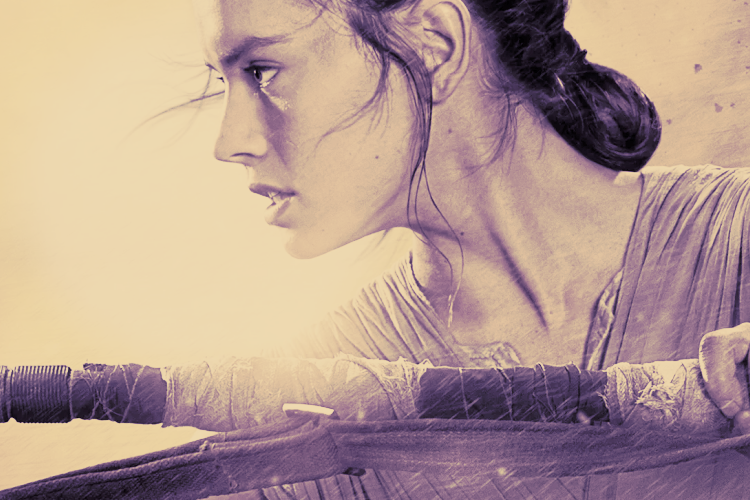 Costumes from the theme parks and movies have made appearances before. It was Fantastic Beasts and Where To Find Them’s turn this year. 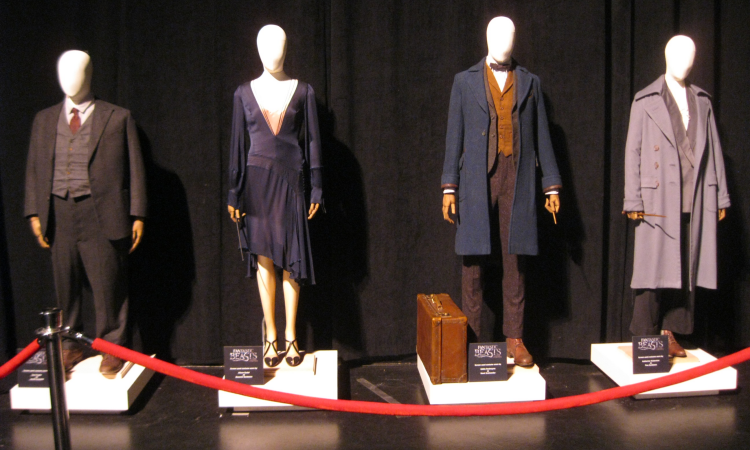 The principal outfits for Jacob Kowalski, Queenie Goldstein, Newt Scamander and Tina Goldstein were on display, and they were all gorgeous. Tina’s was my favorite in the movie, and seeing her outfit in person made me want to style my wardrobe after hers even more. Scholastic is one of my favorite exhibits. 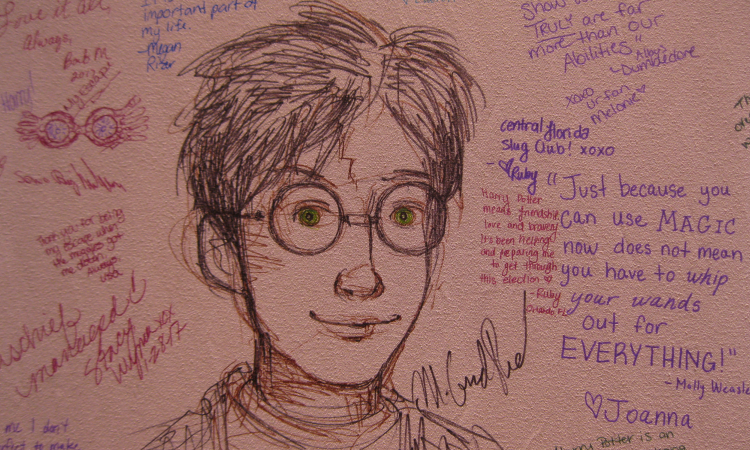 Fans are invited to write and draw about what Harry Potter means to them on a huge cloth wall. It’s always so endearing to see the range of messages shared of kids being inspired to read, who readers’ favorite characters are, and what people have learned from the series. It was hard not to see the big Harry Potter illustration on the whole wall from afar. It was drawn by none other than the series’ original book cover illustrator Mary Grand Pre. I wish I could’ve seen her in person but I had no idea the autograph sessions were open-to-the-public. Still was fun to see her leave her mark again. 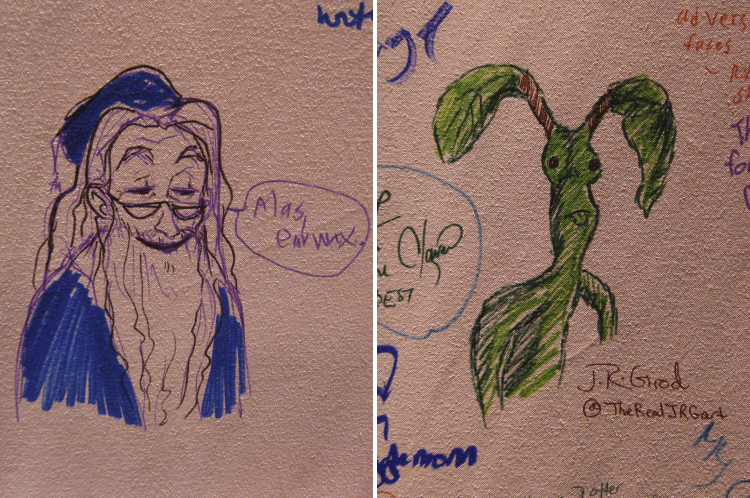 And, other fans made an adorable Dumbledore and Draco Malfoy. 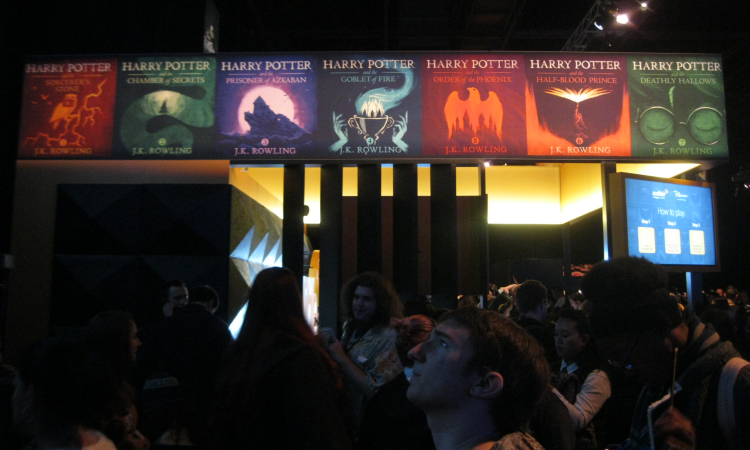 The Harry Potter Exhibition is another regular at the Celebration. Their interactive set-up is different every time, and it’s wonderful to see what they come up with. This year fans dressed up in Quidditch gear and caught the golden snitch! They also had individual stands where fans threw a Quaffle into a hoop, similar to basketball games at an arcade. I could've played it all day! 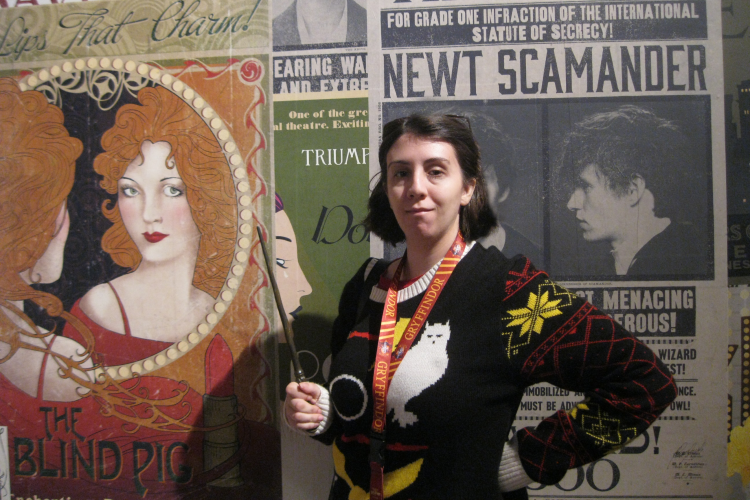 The House of MinaLima transformed their space in the expo to something out of a Harry Potter. They're the graphic designers who created nearly everything you can think of in the movies, including Fantastic Beasts. 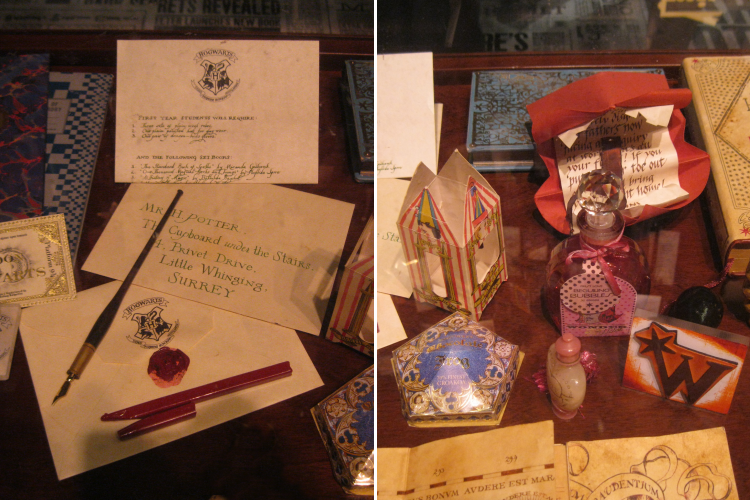 The walls and floors were plastered with copies of their work, props were on display behind glass cases and postcards dangled from the ceiling. I’d be lying if I didn’t walk away wanting to buy everything they’ve ever made. After this expo, I headed over to the second soundstage. Surprisingly, it was less crowded than the first with zero waiting time to get in. This soundstage included Audible by Pottermore, Lego: Dimensions, Fantastic Beasts virtual reality by Warner Bros and Harry Potter and the Cursed Child walk-through. A few more props from the original Harry Potter series were on display – the Ford Anglia from Chamber of Secrets has so much character; the front bender, curved lines and huge headlights make the car look like its smiling. It's much more enchanting than a normal Muggle vehicle. And, the Hermione Granger, to be honest, was quite creepy in person. 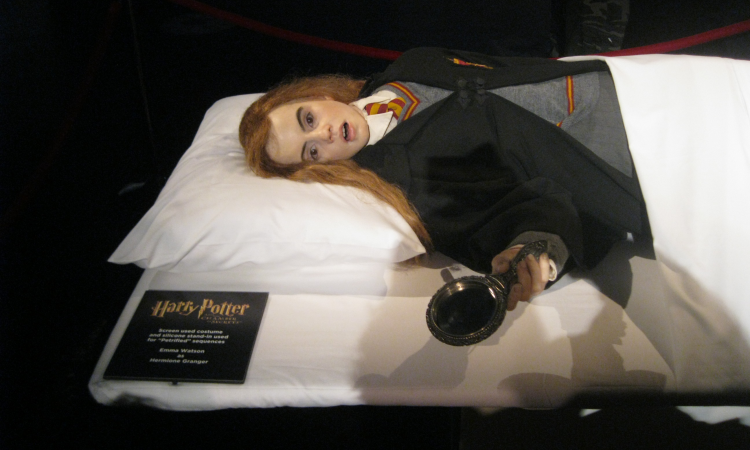 This stand-in is used when Ron and Harry visit Hermione in the hospital wing after she’s been petrified in Chamber of Secrets. If you looked at it long enough, you swore Emma Watson would’ve come to life and hopped out of the bed. Audible, an online marketplace for audio-books, made its debut at the 'convention'. Fans competed against each other by listening to Jim Dale’s narration from the Harry Potter books and guessing which book the passage came from. Every player was given a Harry Potter coaster for participating, as the scoreboard leader won a prize pack. I made it to second place (and got a Half-Blood Prince coaster), and it was honestly something I would’ve done all day. I hope it comes back next year! 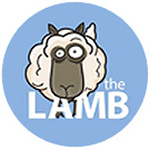 You’ll know where to find me! The Harry Potter and the Cursed Child walk-through gave fans the chance to see some of the props on display. We were instructed to "Keep The Secrets" by taking photos of the props but not posting them online. So, sadly I was sworn to secrecy but the props were pretty cool. Scorpius and Albus’ wands were almost nothing like I expected them to be – just how the woods and styles were chosen and crafted. It made me wonder if there will ever be a day where the wands are available for purchase. The Fantastic Beasts virtual reality exhibit by Warner Bros. was closed by the time I made my way over there. The Q&A session with the cast was fastly approaching, so I opted to try the Lego: Dimensions interactive display, where fans played different fictional characters in all kinds of landscapes from Star Wars, Batman, and Harry Potter. I’m not a big video gamer, but I got completely sucked in by the amazing high-definition graphics of Hogwarts, and getting to play Hermione Granger too. The atmosphere was pretty reserved while sharing some fun memories made during filming. Warwick Davis is always the most positive force at every convention I’ve seen him at. He opened the panel with teaching everyone a lesson of Wingardium Leviosa. Then, the group answered questions from fans, who asked everything about pranks played on the set, and if Tom Felton was available (he was). Issacs admitted to trying to pull a prank on Felton by changing his smartphone password, and that backfired – Felton traveled to another country shortly afterward and couldn’t get into his phone. They also all agreed that Neville’s sweater in Harry Potter and the Deathly Hallows Part 2, and Severus Snape’s robes were their favorite costumes. The day seemed to be over before it started. So, this was my weekend at A Celebration of Harry Potter 2017! Besides the wonderful panels I experienced, there was some exclusive merchandise I snagged too. Another post will be coming up soon for that. With two separate soundstages of exhibits, and panels all-day long at both theme parks, it’s not hard to imagine how fast this will turn into something much longer and even bigger than a weekend. I can’t wait to see what the next event has in store!